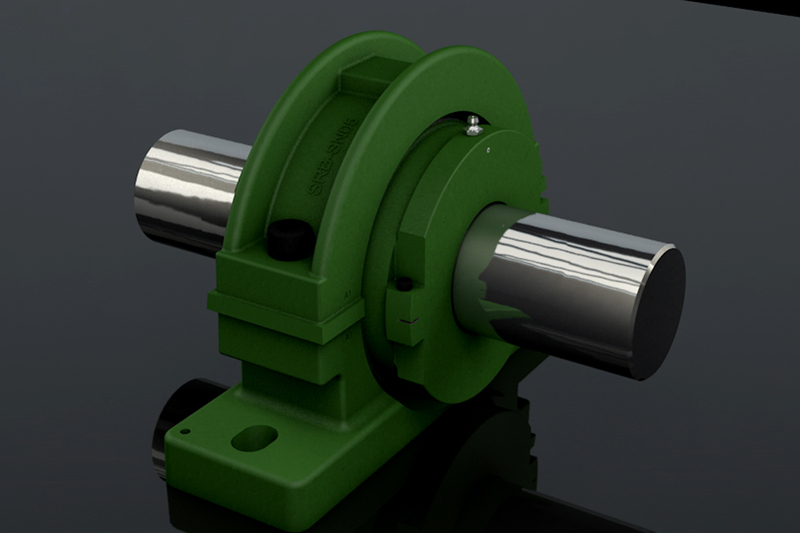 Split Roller Bearings have been on the market for many years and during that time their external appearances haven't changed a great deal, but, that isn't to say that all designs are equal. New design techniques and changes in materials mean that some bearings can last far longer in operation than others. So what features should end users be looking for, and are they available across the board? Adrian Menzies, Sales and Marketing Director for Revolvo, describes some of the newest innovations and explains why Revolvo ensures that all its SRB products are fitted with them as standard. Since their invention, Split Roller Bearings (SRBs) have been used in demanding applications across various industries to reduce the cost of installation, routine maintenance and replacement. Thanks to their unique, 'split-to-the-shaft' design it is easy to install, maintain and replace SRBs without having to lift or remove the shaft from the drive to obtain access. Because of this improved access it is possible to reduce production losses caused by maintenance downtime by as much as 90 percent, which means that most SRBs pay for themselves many times over during their life. However, as with all mechanical components, some designs are better than others. Over the last 20 years there have been many innovations which have improved the reliability of split roller bearings as well as the ease with which they can be installed. Despite offering significantly improved performance, many of these features are missing from some products on the market today. This can lead to reduced service life and frustrations during the installation stages. Recent studies have shown that, for ultimate reliability in bearings of this type, precision machined bored pocket brass cages offer the best results and outperform pressed steel, aluminium and polyamide materials. Brass offers high rigidity, high strength, resistance to shock loads, can be used at high temperatures whilst also absorbing lubricant and performing well in environments where lubrication is marginal. Unlike other materials which will often fail without warning, Brass fails very gradually which makes it ideal for condition monitoring, allowing preventative measures to be taken and avoid unpredictable failures. By fully machining brass cages it is possible to deliver improved bearing reliability by ensuring accurate guidance of the rolling elements. When compared to their pressed steel, cast aluminium, or moulded polyamide counterparts it's easy to see how the CNC bored pocket brass cage prevents roller skewing; a condition which can lead to edge loading on the trackway and reduced bearing life. Skewing is a serious cause of premature failure in bearings of all sizes, so the use of fully machined brass cages makes a significant improvement to the overall reliability, and therefore cost saving potential, of split roller bearing technology. The raison d'être of SRB design is to simplify bearing installation and maintenance, therefore reducing the associated losses of extended downtime. For this reason it is essential that the bearings can be assembled simply and without inconvenience. Unfortunately some designs incorporate a separate cage clip which clamps the two cage halves together. These are prone to falling out during assembly and inspection processes, and can easily be lost which can halt production as easily as any breakdown; greatly reducing the benefits of the SRB design. To remedy this problem, Revolvo developed an integrated retained cage clip design. The integrated cage clip is firmly attached to one half of the cage via spiral pins and can easily be clipped onto the other half during assembly - and removed with a flathead screwdriver during disassembly - with no risk of loss. This design also speeds up the installation process by effectively allowing the engineer a 'free-hand'. 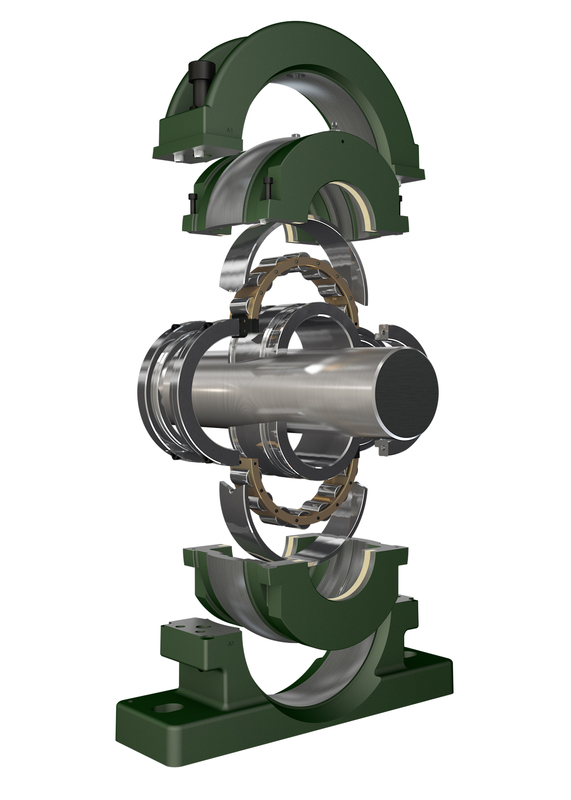 The benefits of reduced installation and maintenance costs of SRB design are only relevant as long as the bearings offer similar performance (or better) in terms of reliability when compared to standard roller bearings. If a bearing is unable to survive in an industrial application then it will never deliver improved efficiency and cost savings. The housing and support pedestal design must be able to cope with the mechanical stresses which will be applied in the application as well as any additional environmental hazards, such as corrosive material, submersion in water or extreme temperatures. Finding an SRB split bearing support pedestal which is manufactured from robust cast iron (HT250- grade material to BSEN1561, 1997, for example) maximises durability; though the actual design of the casting also has an influence, and Revolvo has optimised its design of support pedestal cap by incorporating stiffening ribs to significantly increase rigidity. Despite the undeniable benefits that split roller bearings bring to industrial applications there are many site managers that are wary of specifying them in place of standard roller bearings in case expensive re-engineering is required. A traditional problem with replacing standard plummer blocks with SRB units is that the support pedestal base to shaft centreline is usually higher on a split bearing, meaning that machinery must first be modified before SRBs can be installed. By specifying Revolvo’s SRB split bearing it is possible to find products which have been designed with interchangeability in mind, offering a drop-in replacement, which means that there are no additional, expensive re-engineering costs associated with changing to split bearings. Revolvo was the first to launch such a feature in the SN and SD compatible range, which provide a simple bolt-in solution that makes seamless installation quick and easy. Some split roller bearing manufacturers will still mix-and-match, producing bearings with inconsistent & inferior cage materials, older design features, and lower grade materials & manufacturing techniques in an attempt presumably to maximise short-term profits and avoid additional investment in their range. This will have a negative impact on the long term reliability of the product and lead to reduced cost-savings for the end-user. Revolvo believes that it has a responsibility to the customer to offer the best available design, technology and materials across its entire range and without a cost penalty. This policy ensures consistent performance and maximum ROI on a product that is designed to make saving by offering long-life and convenience in both operation and service.